CP/CENT/INT/2. Chiefly materials relating to the Sino-Soviet dispute begun in 1960 following remarks made by Khrushchev at the Romanian CP's congress, accompanied by copious notes mainly by Gollan. Includes one file relating to the Vietnam. CP/CENT/INT/02/01. Communist Party of Romania congress, Bucharest, June 1960. At a private meeting of delegates from fraternal parties, Khrushchev made his first direct attack on the leadership of the CP of China. Handwritten notes taken at the time by the British fraternal delegate, Peter Kerrigan, and notes by John Gollan for a report to the CPGB leadership. Created June to September 1960. CP/CENT/INT/02/02. Discussions with the CPSU, 1967: notes by John Gollan, draft joint communiqu�s with annotations by John Gollan and George Matthews, press reports. Created September 1967. CP/CENT/INT/02/03. John Gollan's trip to North Vietnam for the funeral of Ho Chi Minh. Notes of discussions with Vietnamese leaders, press reports and press statement, details of funeral arrangements. Also further notes by Gollan on visit to Vietnam post-defeat of America. Created 1969-1973?. CP/CENT/INT/02/04. Sino-Soviet dispute: materials assembled by John Gollan and George Matthews. Notes by Gollan and Matthews for reports to the CPGB EC; handwritten records of discussions with Khrushchev in 1963; Matthews' draft report on the ICM to the 28th CPGB congress in 1963; notes on the Sino-Indian dispute; resolutions on the ICM adopted by the CPGB EC; documents, etc. Created 1960-1963. CP/CENT/INT/02/05. Sino-Soviet dispute - materials assembled by John Gollan and George Matthews. Notes by Gollan and Matthews; handwritten records of discussions with Khrushchev, Boris Ponomarev and Liu Shao-Chi in 1963; notes for reports to the party leadership; notes taken by Bill Alexander; documents, etc. Created 1963. CP/CENT/INT/02/06. 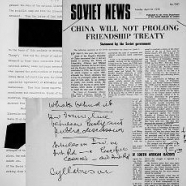 Sino-Soviet dispute - materials assembled by John Gollan:- 4 letters between the CPSU and the CP of China, supplied to John Gollan by the latter, with notes by Gollan on the CPSU viewpoint. Note by Monty Johnstone: "CPGB leadership informed the CPSU about [these letters], and apparently asked for information from the CPSU, which confirmed that these copies of letters corresponded to the originals. The CPSU leadership gave Gollan a detailed exposition of its views on the points at issue. This appears to have been dictated to Gollan, as it is copied in his hand." (See the 33-page handwritten document in this file.) Created Autumn 1965. CP/CENT/INT/02/07. Sino-Soviet dispute - materials assembled by John Gollan:- Letter in Russian from CC CPSU to CC CP China, CC CP China reply in Chinese and English translation. Created 28 November 1965, 7 January 1966. CP/CENT/INT/02/08. Sino-Soviet dispute - materials assembled by John Gollan. Correspondence between the Polish United Workers' Party and the CP of China - English and Russian translations, Polish and Chinese originals. Created 28 December 1965, 7 February 1966. CP/CENT/INT/02/09. Sino-Soviet dispute:- materials assembled by John Gollan. Internal CPGB reports from London District CP and other organisations on the level of support for the Chinese position in the dispute; notes for EC meetings by John Gollan; draft article by Jack Woddis and covering letter; statements on the ICM; message of greetings to the 23rd CPSU congress. Created 1963-1966.